As expected, a couple of lawsuits challenging San Francisco’s recently approved Central SoMa Plan have just been filed in San Francisco’s Superior Court and more could soon follow. 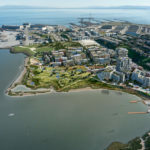 The first two suits, one of which was filed by the Yerba Buena Neighborhood Consortium (Todco) and another by a local resident, both challenge the adequacy and findings of the Environmental Impact Report (EIR) for the Plan as certified by the City last year. As such, Mr. Berk is seeking to have the certification of the Central SoMa Plan’s impact report and all subsequent approvals overturned, along with “a preliminary and permanent injunction directing the City to cease and refrain from engaging in any action or issuing any land use approvals” in reliance of said Plan (and an award of all legal fees and equitable relief). We’ll keep you posted and plugged-in as the suits progress. I’ve heard several people in planning commission basically admit the fact that Central SoMa was designed for offices. Long, blocky, mid-rise office buildings that allow companies to have large ‘warehouse’ style offices. Several of the buildings in the plan abide by this design. It was purely a play by office developers with little to no benefit for current or future residents. The jobs/housing imbalance is a huge side effect by the real motivations of the rezoning. Whether companies choose to setup employees with cubes or rows of desk is really up to them. Cities should focus that design meets fire and earthquake safety, but not desk layout. eh, it was always set up for long, warehouse like, blockwide buildings. One reason they don’t have serious impacts is that so few people drive to the games. There aren’t many parking spots available. The petitioner isn’t wrong, but it feels like taking this argument to its conclusion would imply any new office or residential building would have the same impact. Perhaps the argument is that the EIR didn’t address that, rather than address it and simply accept the negative impact? Perhaps Professor Berk could help to ameliorate San Francisco’s job-housing imbalance by moving from San Francisco to closer to where he works. I wonder whether he’s also suing Palo Alto because of its refusal to allow enough housing for those who work there. The possibility that an individual who (even with his Stanford teaching credentials) ignores the fact those wide streets and that proximity to transit of Central SOMA make it probably the single best place in the city to gain density for office space, can potentially derail seven or so years of planning and millions spent on design for development of the plan, is ridiculous. This is so far from democracy – its pure self-serving obstructionism, not so different than Trump and his inane Wall antics! He is working from home. In a normal balanced region I’d agree but it seems unreasonable without more transit capacity from the East Bay and beyond where workers will live. Electrification of Caltrain will help (assuming the administration doesn’t pull away the money). Also this is more reason to work on another BART tunnel. There is no need for another BART tunnel. They are adding more than double the number of trains to the current tunnel as soon as the electric capacity issue has been dealt with. Echoing the other comment. Completely wrong. It’s not mainly an issue of getting new train cars or electrical infrastructure. The BART train control system is older than the universe itself. That’s the problem. And even a modern one doesn’t give the Transbay Tube unlimited capacity. Adding a bart tunnel is expensive and unnecessary at this point. Until BART has a two minute service frequency like Hong Kong and Beijing, an additional tunnel is just to pad contractors wallets. Upgrade the signaling and do what’s operationally difficult but beneficial for the tax payer. The BART Core Capacity Program will relieve crowding, increase ridership, and decrease greenhouse gas(GHG) emissions by increasing the frequency and capacity of trains operating on the system. The Core Capacity Program will allow the number of trains operating through the Transbay Tube to increase from 23 to 30 per hour, and peak hour train lengths to be increased from an average of 8.9 to 10 cars, maximizing throughput capacity in the most heavily used part of the BART system. The Program includes four elements: Install new communication-based train control system; Expand the rail car fleet by 306 cars; Provide additional rail vehicle storage at the Hayward Maintenance Complex (HMC); and Install five new traction power substations. These four Program elements will allow BART to decrease current headways on each line from 15 minutes to 12 minutes. Expansion of the rail car fleet will allow for trains of 10 cars, making additional capacity in the system. The overall increase in peak hour capacity created by the Core Capacity Program will be about 45%. Current BART tunnel still has plenty of capacity left in it. Today’s state of the art train system can run up to 36 trains per hour. BART is currently in the 20-22 range. In order to bump that up, they need more electrical power – and new stations are currently being built. They need trains that load/unload faster, and that’s already in progress. Lastly, they need a new train control system, but I believe that they’ll want it only once the fleet is upgraded. I’ll throw in that the escalators move much slower than ones I rode in London. Either way, transit improvements are in progress. We could also add some red bus lanes and bike lanes on Bryant and Harrison where we currently have a 5 lane car parking lot during rush hour. BART stations are at capacity, plus with only one tunnel it can’t run 24 hours a day for maintenance. Another tunnel will be expensive but it’s necessary. BART stations are only at capacity because people are standing around waiting for a long time for a train. With higher service frequency there will be less dwell time. They can single track at night through the tube with large headways. Maintenance is just an excuse not to run during the night, the need for maintenance is not higher in the tunnel compared to other places with just two tracks. BART actually just announced that they’ll be single tracking late at night so there’ll be train every 24 mins instead of every 20 mins through the tube. For anyone wondering how to do 24hr service, BART just provided the answer. i personally prefer a bridge with both rail and car lanes. We need sufficiently more capacity for both modes of transit. > i personally prefer a bridge with both rail and car lanes. We need sufficiently more capacity for both modes of transit. It’s called the bay bridge. Now that CEQA is going to be based on VMT instead of LOS, maybe we can just have Amtrak (rail lines conveniently close to the bay bridge on the Oakland side) run to the transbay terminal (conveniently near the bay bridge in SF). We could also expand BART service running on the lower deck of the bay bridge, which was previously rail. Probably political suicide at this point though, due to the car driving majority. But it does have the ability to serve the greatest number of people at the cheapest price point. Amtrak can’t run over the Bay Bridge, if that’s what you’re suggesting. It’s not physically possible. Agreed. By “more transit” we need to address serious transit upgrades in the 7×7, as well as regionally, especially from the east bay and peninsula. BART keeps pushing into the suburbs and ignoring existing dense core centers and areas slated for major development, like Central SOMA. Muni is basically useless when it comes to infrastructure and we already know the DTX keeps being pushed back. So, in ten years time when a good chunk of the development, be it commercial, housing or a mix, is already completed transit will fail to meet any demand. Not joking on this one. Add in $200mm to the budget for Geary merchant rent subsidies for 3 years. They can ride it out. Then upzone Geary to 100′ from Ocean Beach to downtown. Yes! And the city would rake in additional tax revenues from the higher zoning along Geary. If BART won’t do it, MUNI should. Um, there absolutely does need to be a jobs to housing balance in the CBD. There are already far too many jobs in the CBD that cannot be accommodated. Like for example the 5,000-7,000 units planned for The Hub right on top of Muni Metro? 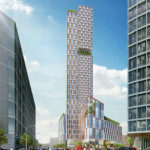 Finishing Trinity Plaza and the other 1,000+ units on Market on top of BART? The housing components in Mission Bay/Mission Rock and the burgeoning Dogpatch construction boom on the T? The 1,000+ units being built and planned in Western SOMA within walking and biking distance? The 1,000-2,000 or so units in Rincon Hill under construction like The Avery, 500 Folsom, Jeanne Gang tower, Modera etc? If I sum up all your high estimates — several of which I think are unrealistic — I get 11,000. The plan anticipates 32,000 new jobs. And we don’t have nearly enough housing for the jobs we already have. Was really hoping Brown would have tackled some of the many CEQA issues. I believe he mentioned it being something he wanted to make headway, too bad really. Management plans and the like really should be exempt from CEQA. Are you kidding? No need for a new tunnel? What if the tunnel has to be shut down? Then what? Think 40 years down the road! 2x capacity on the current line (which I think is overstated, but do you have a source to that) will be eaten quickly. Auto capacity is maxed. The only transit options here are subway, hyperloop, the boring company, and maybe flying cars eventually? The jobs vs. housing imbalance problem is real. If this project doesn’t do anything to level the balance then it should coupled with another project in the city (or somewhere nearby like Brisbane) to balance with housing. Or like telling the west side to pound sand and that densification is going to occur out there. 40 years down the road, we’ll still be rebuilding from The Big One. Once again, it takes one person, sitting in their penthouse, to slow that the process in a city already short on housing stock. Short supplies of housing means expensive housing for everyone else… Then people ask, why things don’t happen faster and why we build bad architecture. This is the reason why! The City needs more housing. SoMa would be a great place to build it. The Planning Departments current proposal is just a give away to well-off office developers. iIt needs to be significantly revised to address the needs of the City. This housing/jobs balance is a BS argument in this case. Cities (successful ones at least) need to grow, evolve and get denser, especially in strategically located areas that are not yet very dense — and that is a fact! You don’t like it, don’t live in the city! Agreed that area should get denser – it’s what cities do. But it can get denser with housing. All housing. 100% housing. Want another tech-bro corporate castle? Go build it in San Mateo county. SF has had enough. The argument in the Central SOMA plan is that jobs should be located in places that are served by the largest number of transit connections instead of homes. Home densification needs to occur, but in areas where said people can take transit to said jobs. So from this is makes sense to increase the number of jobs in the central soma area, while increasing housing density in some other neighborhoods like the sunset. The issue is that SOMA is also the best place to accommodate future office demand as it’s on top of all of our major transit systems (MUNI Metro, CalTrain, and BART). For example it is completely non-sensical to build office buildings on the M/K/J/N etc train lines as you spread out from the core. The opposite is not true. This is not the only logical place to put large scale residential projects. Few who are pro-Central SOMA believe the city’s housing and jobs balance is appropriate. They just see the benefit of allowing for future office growth (because remember, Prop M will not allow all this to be built at once) in the smart location for it, and adding housing elsewhere. 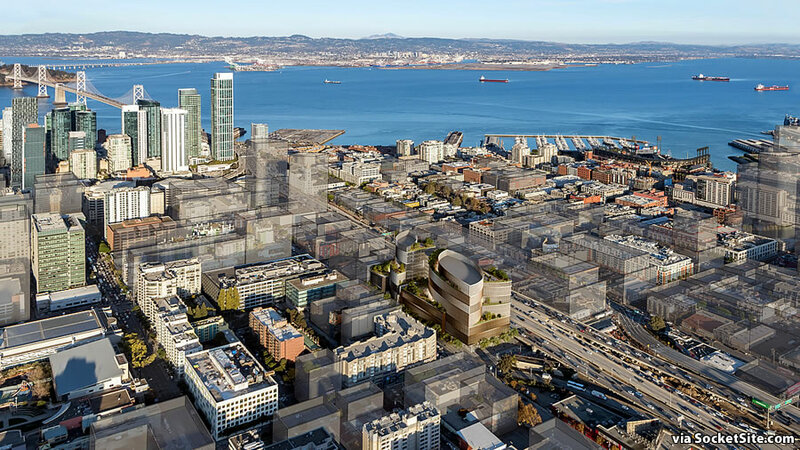 Which is being proposed and built in The Hub, Western SOMA, Transbay/Rincon Hill, South Beach, Dogpatch, and Mission Bay, all of which is on top of transit that leads directly into Central SOMA. And of course I would love to see appropriate densification and infill on all BART and Muni Metro stations that lead into this area as well. And also should mention that I’d love to see further densification on suburban BART and CalTrain stations as well, like what we’re seeing in Dublin/Pleasanton, San Carlos, Redwood City, and San Mateo currently. A better housing/josbs balance is what makes a city liveable. I’ve lived in SOMA for 30 years. The City has treated SOMA as a dumping ground for everything undesirable elsewhere for decades. I cant’ afford to sue but I thank the professor for doing so. SOMA needs more market rate housing to be a viable neighborhood, not to add to its commuting Hell situation. This site is full of hyporcrites who don’t care what happens to SOMA.